« In the skin of a . . . hadrosaur? It’s almost impossible to write about extraterrestrial communication without mentioning Carl Sagan. For starters, he wrote the novel Contact, an iconic imagining of what would happen if humans received a message from an alien civilization. (The novel was the basis for 1997 film of the same name. TSF has organized a screening of the film as part of the festival, including an appearance by Jill Tarter, the inspiration for protagonist Ellie Arroway.) But Sagan has also been behind nearly every high-profile attempt to send a message to the stars in real life: the golden plaques on Pioneer 10 and Pioneer 11, the Golden Record on Voyager 1 and Voyager 2 and — along with American astronomer Frank Drake — the Arecibo message, which was broadcast in 1974. Unfortunately, the destination chosen for this message, a globular star cluster known as M13, is 25,000 light years away, meaning it will take another 50,000 years to receive any possible reply. Mike Reid, an astronomer at the Dunlap Institute for Astronomy and Astrophysics at the University of Toronto, is the person who came up with the idea of adding the Messaging Extraterrestrial Intelligence (METI) contest to the Toronto Science Festival. Reid is aware that he’s evoking the spirit of Sagan, but he points out that we now have information that Sagan did not. “In 1974, we didn’t know anything about the planets of other solar systems,” says Reid. “[Sagan and Drake] tried to maximize their odds by hitting a whole bunch of stars simultaneously, but it was very much a shot in the dark.” Today we have instruments like the Kepler space telescope, which was designed to hunt for small, earth-like exoplanets by monitoring tiny shifts in brightness of stars as those planets pass in front of them. The confirmed number of such exoplanets changes almost daily; so far it’s over 150, but there are thousands more awaiting confirmation, not to mention the hundreds of larger exoplanets – gas giants like Jupiter – found by other telescopes. Reid and his team have two targets. The first is Kepler 62, a star somewhat smaller and cooler than the sun. Earlier this year, a paper in Science reported that Kepler 62 has at least five planets, two of which are likely rocky ones within the so-called “goldilocks zone” that scientists believe is neither too hot or too cold to support life. Kepler 62 is a lot closer than M13, but at 1200 light-years away, it’s still much too far to entertain a reply within our lifetimes. Therefore, the message will also be broadcast to a star called Tau Ceti which is only 12 light-years away, close enough that you can see it without a telescope (it’s in the constellation Cetus, the whale.) Although an above-average amount of dusty debris makes it hard to see, scientists believe that Tau Ceti also has at least one rocky, earth-like planet in the goldilocks zone. With the recipients selected, the next challenge was finding an instrument with which to send the message. The natural choice was the Algonquin Radio Observatory (ARO) which houses Canada’s biggest radio antenna; in fact, it’s one of the largest fully steerable dishes in the world. The ARO was built in the early 1960s, during a time when rich countries were trying to one-up each other by building ever-bigger dishes. (Such rivalry continues today, with China coming along quite nicely.) 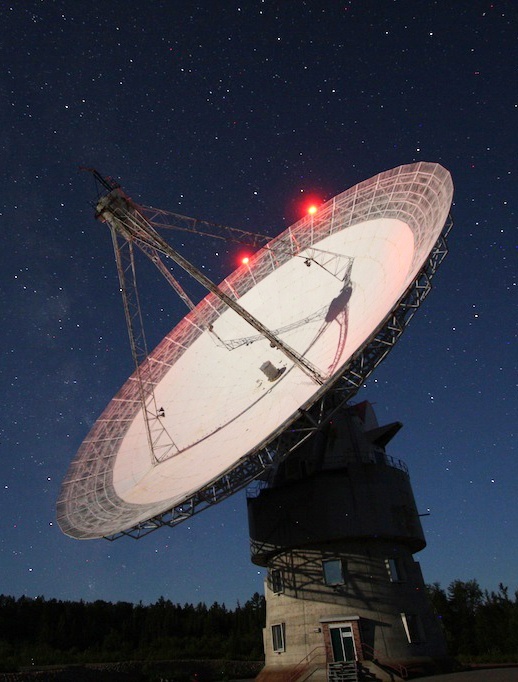 Its remote location was chosen in order to avoid light and radio pollution from nearby cities, and it’s an added bonus that during the winter the air in Algonquin Park is free of water vapour, which can interfere with astronomical observations. Archival footage from CBC relives some of the excitement from the era when it was first created. The Obervatory’s website lists a number of scientific achievements — I was particularly interested in its discovery of relatively large molecules called cyanopolyacetylenes floating randomly in space — but the facility is best-known for its experiments in Very Long Baseline Interferometry (VLBI) which began in the 1990s. This is a technique whereby several radio telescopes around the world observe a single astronomical object (like a pulsar) at a single moment, timed with exquisite accuracy using tools like hydrogen masers. By measuring the differences between when the signal arrives at one location versus another, it’s possible to triangulate your position in 3D space to within a millimetre. “As a consequence of this activity, the observatory became the most well-mapped location on earth,” says Brendan Quine, co-founder of Thoth Technology, Inc. the private company that now operates the ARO. Today, VLBI is the standard against which the Global Positioning System (GPS) is calibrated. Quine says it will be relatively easy to replace one of the radio receivers at the focus of the dish with a transmitter. The plan is to send the message using Internet Protocol (IP) — the same system of numerical data packets used to transmit this web page from my server to your computer. It may seem like an arbitrary choice: after all, we have no reason to suspect that aliens will speak the binary language of computers, and they may not be able to distinguish which packets are the actual message as opposed to the ‘electronic envelope’ that contains information about the sender. But according to Quine, this “high-intensity version of the WiFi signal” may already be familiar to aliens for the simple reason that so much radio traffic on earth already consists of it. “If anybody’s listening to any signals on Earth now, everything is carried on internet protocol,” he says. This will be my last post for a while. I’m taking a new job with the Science Media Centre of Canada, and while I’ll still be keeping up with Canadian science news, I will mostly be catalysing the writing of others rather than doing it myself. While I’m gone, I encourage you to keep up the conversation. What do you think is worthwhile about life on this planet that could/should be shared with the rest of the universe? Let me know in the comments below, and I’ll write back when I can.